Why does it cost nonprofits on average $20 to raise $100, while it costs companies only $4? Simply put: nonprofits don't have the leverage they need. The End of Fundraising turns fundraising on its head and teaches nonprofits how to stop begging for charity and start selling impact. Learn to use and attach real economic power to social outcomes and create the leverage your organization needs. 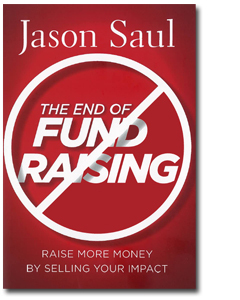 Author Jason Saul uses his 15+ years of experience in advising the world's leading nonprofits, foundations, and corporations to help share how you can 1) identify new market stakeholders; 2) capture and communicate impact in simple, compelling terms; and 3) improve the success of your pitches to funders.